Cancer is nowadays one of the leading causes of death around the world. It is a broad spectrum of a disease and it is responsible for 30% of the deaths in Canada. This is significantly more than any other disease or possible cause. Ovarian cancer only was estimated to have 2800 new cases and 1750 deaths in Canada. Also, 22,280 new cases and 14, 240 deaths in the United States just in 2016, the Canadian and American Cancer societies state. 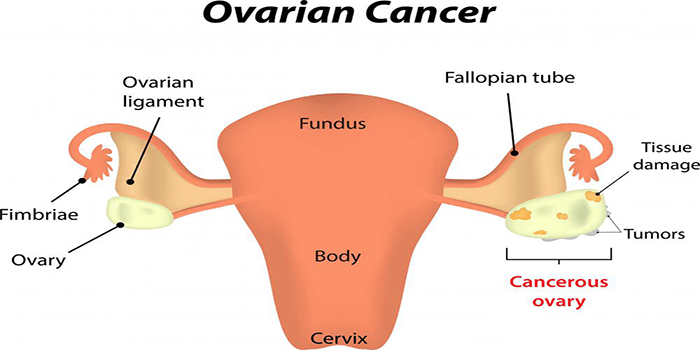 When the cells of the ovaries develop tumors that become malignant, ovarian cancer occurs. This cancer is also known by the name of the ‘silent killer.’ This is because it is very difficult to be detected when screened and there are not enough symptoms to show it. The most common patients affected by it are post-menopausal women. Yet, more and more cases have shown an increase in women in their 30s and 40s, and even younger. Some research in the UK found that early detection of cancer can increase the chances of survival immensely, therefore, you should pay more attention to the signs your body gives. Also, regular check-ins with your doctor would not hurt. A big problem is that there are not any reliable tests for this type of cancer. Smear tests do not pick up malignant cysts, and even CA125 blood tests give false negatives sometimes. Another problem is that many of the symptoms are mistaken for other diseases, like for instance irritable bowel syndrome, which can leave the early stage tumors undiagnosed until it comes to stage 3 and it is already manifested as lumps in the abdomen and pelvic area. If you are going to the toilet much more than you are used to, even though you have made some changes to the liquid intake, or you are fine one minute and you urgently need to pee the next, it might mean that you have the early stages of ovarian cancer. If you have noticed a decrease in your appetite longer than three weeks, you should consult your doctor. Even though this may mean that you have a whole host of stomach, intestine and bowel issues, it also might mean that you have cancer. If your stomach is bloating all the time and it is consistent for three weeks or so, it might mean that the cancerous tumors are growing. All of these symptoms are often mistaken for issues with the Gastrointestinal tract. However, if you have just started developing these symptoms it is of great importance to monitor them. If they do not subside after three weeks, you should consult your doctor immediately and check for ovarian cancer. It is very important for women to monitor their health, and to also inform the other women in our lives. This way we will be able to recognize the potential symptoms of this fatal disease. Therefore, now that you are informed on ovarian cancer, make sure you inform other women as well. And of course monitor your health regularly.